Hortus Camdenensis | Dahlia pinnata Cav. Frost-tender to half-hardy tuberous-rooted herbaceous plant, bushy, in a wide range of sizes, colours and flower form. Summer flowering. [RHSE, Hortus]. ‘The Dahlia is stated to have been introduced in 1789, by the Marchioness of Bute, as a native of Mexico, and that the Comte de Vandes imported several varieties from France, where the plant had been cultivated for some years with great assiduity, by M. Lelieur, at Sevre, near Paris. (Vide Bot. Mag., vol.XLIV, p.1885) […] I must confess, that it would have been more desirable, to have adhered to Decandolle’s and Wildenow’s name, Georginia, in preference to the more common appellation Dahlia, particularly as we have the genus Dalea, a name by which it is too often improperly called.’ [FC p.108/1841]. Andrews' Botanical Repository figured Dahlia pinnata in 1804, probably the first English journal to do so. 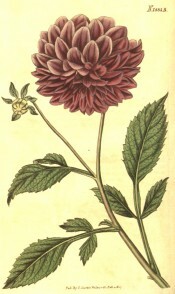 This very new plant was causing some excitement among horticulturalists, who held great hopes of improvement: ‘There are considerable reasons for thinking that the pinnated Dahlia will hereafter be raised with double flowers, because the figure in Cavanilles’ Icones represents them nearly semi-double; and the doubling of radiated syngenesious plants is well known to horticulturalists to be a circumstance of pretty frequent occurrence.’ [ABR pl.408/1804]. The Botanical Register figured a bright scarlet, single-flowered variety. [BR f.55/1815]. ‘This species varies so much, not only in the colour of the flowers, but also in the form of the leaves and in general structure, that, at first sight, it might be supposed to be readily separated into several distinct ones. But attentive observation has shewn that the several varieties are, like those of the China Aster, almost endless. […] Our friend, M. Decondolle, in the Annales du Muséum, reckons five varieties, all from the colour of the flowers:- 1. The red-flowered. 2. The purple. 3. The lilac. 4. The pale. 5. The yellowish.’ [BM t.1885/1827]. The dahlia provided such rich material for the florists that by 1840 Paxton's Dictionary was able to comment that ‘the garden varieties of D. superflua are now reckoned by hundreds, many most beautiful’. It seems that by this time many breeders were attempting to cash in on this now very popular plant: ‘The Dahlia season of 1841 is now over, and many parties who have been buying must have felt great disappointment. There never was a greater load of rubbish sent out.’ [Gard. Chron. 1841]. But by 1858 The Gardeners Chronicle, in a report on the Grand National Dahlia Show, could state that ‘few persons who remember what the Dahlia was twenty or thirty years ago could possibly have imagined that its flowers would have been brought to the high degree of perfection, both as regards symmetry of form and variety of colour, that they have now attained’. [Gard. Chron. 1858]. With the huge number of cultivars then available it was by no means unusual for several varieties of a florist’s flower to be given the same name, hence the practice of including the name of the breeder with the cultivar name, e.g. Dodds’ ‘Mary’. Listed in all published catalogues [B.104/1843]. Most garden cultivars are hybrids derived from D. pinnata and D. coccinea. It is likely that the plant listed as Dahlia superflua and all the named cultivars grown by Macarthur are of this origin. Florist’s dahlia: ‘A fine flower should be of a perfectly circular form; the outer petals stiff, well rounded and cupped – not too much so as to present a quilled appearance – and well filled up to the centre, not in the least degree showing the eye; neither should the eye be at all sunk or flattened, but rather elevated above the other parts when in full bloom; the whole flower presenting a true circle even when viewed above, but of a hemispherical form when observed at the side. Those flowers possessing two colours to have them clear and distinct.’ [FC p.133/1855].